The striking contrast of color and serene image of this metal wall art will bring tranquility to any space. 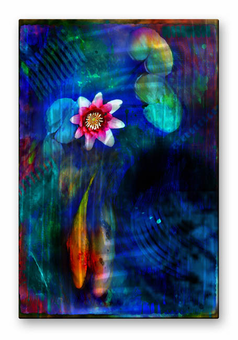 A pair of gold koi fish swims in unison beneath vivid blue water dotted with pink and white water lilies and lily pads. The rippling surface of the water makes the scene even more inviting and realistic.